Viruses and malware typically target desktop or laptop computers, but because we often use the same web browser on our mobile devices, they can also be at risk. That’s why we’re seeing an increase in security apps created for mobile operating systems like Android and iOS. 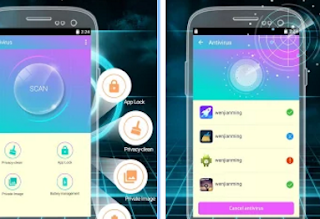 An Android app called Phone Security: Antivirus & Clean wraps a variety of useful utility programs into one protective app. The key feature is an antivirus scanner that uses a cloud-based engine to scour the phone for the latest and most common threats. The app also includes a feature that improves the phone’s memory by deleting background applications; a PhotoVault, which stores selected images in a password-protected location; and AppLock, which hides apps that you don’t want colleagues or family members to see. The app also includes a stealth browsing mode and a battery monitor. Phone Security: Antivirus & Clean is available and a free, ad-supported app in the Google Play Store.